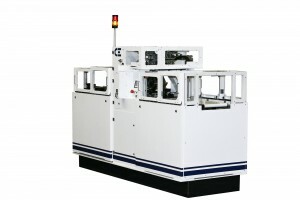 Controls Engineering has released the APT-RC - fully automated banding line. This new banding line comes standard with the CE Reactive Tension Control system that can automatically adjust for varying sizes and shapes of product while still providing finite tension control and the Automatic Roll Change System. Shuttle System: Quickly shifts products in and out of the Banding Position for High Speed Operations. Pneumatic Product Holding Device (Clamp): Stabilizes products during the banding Cycle. Adjustable Side Guides: Align Products as they move in and out of the banding system. Automatic Roll Changer (ARC): Device that allows for continuous operation of the banding machine. The ARC will automatically remove an expired roll of film and replace it with a new roll of film. Time to change a roll with the ARC is less than 8 seconds. The Accumulator Function of the Infeed Conveyor will hold the incoming products while the roll is changing. Automation Interface: A bank of discrete Inputs and Outputs is available to interface with upstream and Down Stream equipment. The Interface Signals typically include: Machine Ready, Machine Fault, E-Stop, and Film Low. Light Tower: LED light tower has an Amber Light for "Film Roll Needed" and a Red Fault light. Exit Conveyor: The Exit Conveyor is a flat belt conveyor enclosed by a Tunnel Guard made from Aluminum Extrusion and clear Polycarbonate panels. The Tunnel Guarding has access doors on either side equipped with safety switches. The Tunnel Guarding also serves to keep personnel away from moving parts within the Banding Machine itself.